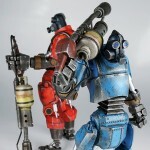 3A has released a slew of new photos for their upcoming Team Fortress 2 Robot Pyro Figures. There is a Red Robot Pyro and a Blue Robot Pyro. These 1/6 scale figures stand just under 11″ tall and feature 30 points of articulation. They feature LED light up eyes, a flame thrower, magnetized grenades and a code to unlock in-game content on the Steam version of Team Fortress 2. The figures go on sale May 17th, 9:00AM Hong Kong time. they will sell for $220 each, or $400 for a 2-pack. Prices include shipping. 3A has revealed two new Team Fortress 2 Robot Pyro figures. The image is not of the final product, so some details may change before release. There will be both a Red Pyro and a Blue Pyro reworked as 3A designed robots. We’ll have more images and info as they become available.